There are several of us coin dealers nationwide who’ve been in this business virtually all our lives – for 40, 50 or 60 years, or even longer – since we were teenagers, or even younger. We’ve been around the market for gold bullion all that time and have been buying and selling gold as physical assets. We’ve all handled rare coins, collected for their numismatic attributes, such as high grade or rare date gold coins, and we’ve bought and sold gold bullion coins, valued just for their precious metals content, such as South African Krugerrands, Canadian Maple Leaf coins, and American Eagle gold coins, all one ounce of gold each. There are also smaller sizes. As coin dealers, we’ve lived with the great swings in the gold price from $35 per ounce before the gold window reopened for Americans to own gold during the early 1970s to the record high price gold bullion reached during January, 1980 of $850, and to today’s record price of around $1,900 per ounce. We’ve also lived with a depressed market for gold bullion that last pretty much during the rest of the 1980s and 1990s while the economy was being pumped up by the country’s rising debt load. Then the gold price began to perk up again during the early 2000s. For many of us in the coin business, what’s going on in the foundations of the financial world these days is intuitive. The recent record high prices for gold have not been a mystery to us, or even a surprise. We see the foundations of the world economies weakening because of the massive debt load, from individuals, to cities, counties, state governments, and federal or sovereign debt. Social tension around the world is growing, and so is crime. Since World War II several generations have lived very good lives, as least economically speaking. But in doing so, our economies have been pumped up through taking on all this debt. And now it’s become unsustainable. The solution is to cut way back on government spending and produce tax revenue and employment through private sector productivity. Now the day of reckoning to pay for our good times since the war is upon us. Politicians and governments are trying their best to put this off, by putting “band aids” on the problem, like all those stimulus dollars that have been pumped into economies around the world during the past three years. Even though gold doesn’t produce an end product, like a business does, for example, gold has been recognized as the ultimate form of money for literally thousands of years. We have to have something that represents stored value to trade for goods. When the United States Mint was created during the early 1790s U.S. coins had to contain a specific amount of gold, silver, or copper. There was no official paper U.S. currency at that time, however most people remember “Colonial Currency,” used in the colonies before we became a country, which is what preceded the official coinage of the United States of America. The U.S. didn’t have paper currency, as we know it today, until the Civil War days. Precious metals were our currency. When paper currency was introduced into the U.S. economy, during that time, it represented a specific amount of gold or silver that was stored in vaults. For example, many people remember the “silver certificates” the U.S. used for generations. Because the price of silver was rising and the value of our paper currency was falling, the U.S. government stopped redeeming those silver certificates back in 1968. But because our society was so used to using paper money, most people didn’t notice what was happening. As this evolution moved further away from using precious metals as money, i.e. gold, silver, and copper coinage, as mandated by the young U.S. government in the 1790s, money became nothing more than paper certificates, then became computer digits, in the bigger picture. Today our money is “faith-based!” Nothing stands behind it, except the faith in our government leaders – people, just like you and me. It’s all just notations inside computers, except for the actual paper certificates in people’s wallets and cash registers. So today our government leaders, in a good-hearted attempt to preserve our standard of living, are doing what they can to avoid an all out collapse of our financial system, exemplified by the events of late 2008, when we began to see runs on banks and financial bailouts. These bailouts, and using government and Federal Reserve created stimulus money, are just temporary fixes, while avoiding the austerity measures needed. People simply don’t want to reduce their living standards. But this may be forced upon us through natural market forces that readjust all the pumping up through the debt load that’s been taken on virtually throughout the worldwide economy, including households. But those people who’ve been around gold for a long time, like coin dealers, know our economy is heading back to using inflation, by creating money, to stave off a depression that we all want to avoid, because we know what times were like during the 1930s. Inflation is not just printing more dollar bills, or $100 dollar bills, or even larger denominations, like $500s and $1,000 dollar bills that we used to use. There even used to be $10,000 and $100,000 bills that were mostly used within the banking system! And this could happen again. To illustrate, some people have even seen the 100 trillion dollar notes issued by the country of Zimbabwe during the past few years because of inflation. But inflation is created more behind the scenes, where the general public doesn’t realize what’s happening. It’s a complex system of using the Fed (the Federal Reserve System) to create financial instruments, like bonds, that are traded on a high level – between governments, as well as in the private sector. Inflation will make times seem better on the one hand, because the economy will seem like it’s churning along, but prices will rise dramatically and purchasing power will diminish, like during the late 1970s. Imagine paying $10 or $15, or more, for a gallon of gas! When I was a youngster, the lowest I remember gas costing a mere 23 cents per gallon. And people older than me remember it being even cheaper. So, yes gold doesn’t produce anything useful, like a factory does, but it’s a “store of value” asset that protects us from the destruction of our currency during inflationary times. Traditional investment gurus are claiming that gold is in a bubble because it’s at record price levels. We’ll always hear this as the price of gold continues to rise during the coming years. Will gold reach bubble proportions? – Probably, but only when the economy begins to be productive again, with nearly full employment and a debt load that’s finally under control. Do you see this happening anytime soon? – Not likely! That scenario is many years away. As pension funds and other investment funds around the world come to the realization that gold should be a part of their portfolios, its price will skyrocket even further. It is currently estimated that less than one percent of the trillions of dollars in these funds are invested in gold. In global financial terms, the gold market is small compared to all other investments. Therefore, an investment of just one, two, or three percent, for example, by these funds will push the gold price to extraordinary heights. Just remember where the price of gasoline was during years past, and you can see a similar analogy – only it’s happening faster this time around. When buying gold, many people want to look through a “microscope,” so to speak, and try to buy at a low point in the near term. Unless you’re an expert commodities trader, you won’t be successful. I saw many of my own customers miss some very nice profits in gold because they didn’t buy when it was below $1,000 per ounce two years ago, or more recently at just over $1,400 per ounce, as it was last summer. But does this really matter when gold reaches $10,000 per ounce, as some experts are predicting, because of the inflationary period we’re now entering and because of large investment funds jumping in? The best strategy is to follow the long-term trend. Don’t buck the trend! And be observant of economic trends. We’re now reading and hearing about how the U.S. government recently raised retirement contributions from $16,500 per year to $17,000 per year because of inflation and also raised Social Security checks by 3 ½ percent for the same reason. We’re just at the start of a new inflationary period. Our national debt is now $15 trillion. Three years ago it was $10 trillion, and 10 years ago it was $3 trillion. It’s getting unsustainable, and I’ve read that when it gets to between $20 and $25 trillion that’s when things will really start to get tricky for our government and the Fed to get a grip on the economy. Interest rates will rise very high, like they did during the early 1980s where they reached the 20 percent level. So, get in while we’re at the beginning of this trend, both to preserve the purchasing power of your assets and to profit. For the above reasons, many investors want to invest in the real thing – physical gold – which is outside the financial system, rather than gold stocks, or “paper gold” through large investment pools. 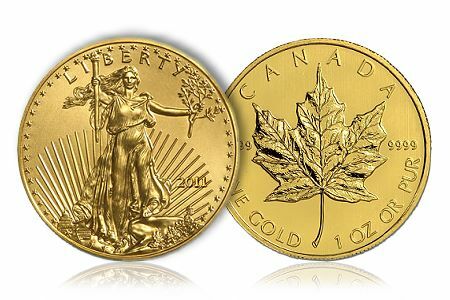 Physical gold is best purchased in one ounce sizes which come in coin form issued by government mints, such as the American Eagle Gold coins produced by the United States Mint, or the one ounce gold Canadian Maple Leaf coins. There are many others, struck at sovereign mints around the world, and experienced coin dealers are some of the best sources to buy them from. Give any of us a call, most of us are happy to answer your questions and help guide you through the process of owning gold – how to buy it, where to store it, how to resell it, etc.